English and American Baptists of the seventeenth and eighteenth centuries lived in two worlds. In one world, established churches were the norm and persecution was the means by which such churches and the civil governments dealt with religious dissenters. Yet these Baptists also lived in another world in which God’s kingdom ruled and the sword of the Spirit (the Bible), not the sword of Caesar, settled religious disputes. When their two worlds collided, and they often did, many Baptists chose to go to prison rather than to violate their consciences by worshipping in churches that they abhorred, by listening to ministers whom they did not choose, and by submitting their spiritual lives to earthly magistrates. Early Baptists knew that they could avoid prison and other hardships if they yielded to the pressures of political and ecclesiastical authorities to conform. Many Baptists considered such yielding as a retreat from their cause and their God, believing that retreat would have been spiritually fatal. They chose instead to move forward in their faith, although it might cost them dearly. Thus, rather than retreat, these courageous Baptists advanced, some to prison and then back to freedom, others to jail and then to the grave. 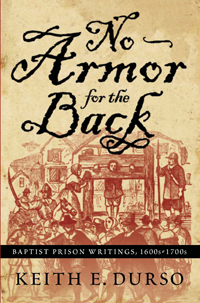 All, however, did so because, like Thomas Hardcastle, they knew that “There is no armor for the back.” Baptists who graced numerous prisons and jails in England and in the American colonies did not remain silent, however, for they continued to preach and to write letters, poems, and books. These Baptists stated their cases without any self-pity and interpreted their persecutions as the natural consequences of professing their faith in Christ.